Champion is an American fashion brand, specializing in sportswear. Champion is well-known for its comfortable and stylish athleticwear. With Big Apple Buddy’s personal shopping service, you can now buy the latest pieces from the USA Champion online store anytime, anywhere. 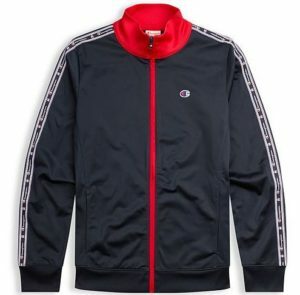 Champion sells some of the best track jackets the States has to offer. The Champion Europe Premium Women’s Track Jacket has the iconic Champion look with its Classic Champion logo jacquard taping accents sleeves. The signature red details make this track jacket a fashionable choice for your morning jog. If you’re looking for something unique, get the limited edition Champion Life Reverse Weave Ombre Dip-Dye Crew. The fleece comes in a variety of color combinations. 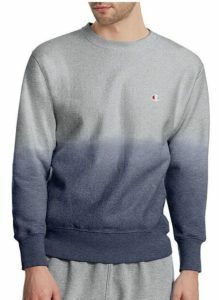 The ombre style adds a fun twist to an otherwise simple and comfortable sweater. The heavyweight fleece and crossgrain cut make sure that the crew will last you a long time. 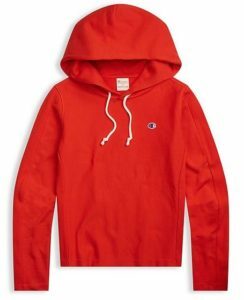 Be bold with the limited edition Champion Europe Premium Women's Recycled Cotton Terry Hoodie in Champion’s bright red. Made from soft recycled cotton and French terry, this sweater is the perfect, classic hoodie. Want variety? Grab a gray one as well for a more toned-down look. Champion ships internationally; however, the USA Champion online store features exclusive pieces that cannot be found anywhere else in the world. Not to worry though! Big Apple Buddy, your personal shopper, can help you buy products from the USA Champion online store and ship them to your doorstep, no matter where you are in the world. We offer international shipping to over 110 countries including Australia, Austria, Azerbaijan, Bahrain, Belgium, British Virgin Islands, Brunei, Bulgaria, Canada, Chile, Costa Rica, Croatia, Czech Republic, Denmark, Estonia, Fiji, Finland, France, French Polynesia, Germany, Gibraltar, Greece, Greenland, Hong Kong, Hungary, Iceland, Indonesia, Ireland, Israel, Italy, Japan, Jordan, Kuwait, Latvia, Liechtenstein, Lithuania, Luxembourg, Macau, Malaysia, Maldives, Malta, Marshall Islands, Mauritius, Monaco, the Netherlands, Netherland Antilles, New Zealand, Norway, Oman, Poland, Qatar, Romania, San Marino, Saudi Arabia, Serbia and Montenegro, Seychelles, Singapore, Slovak Republic, Slovenia, Spain, South Africa, St. Lucia, Sweden, Switzerland, Taiwan, Thailand, the UAE, the UK, Vatican City, and Vietnam. If you would like to buy from the USA Champion online store, simply let us know which items you would like to order (by filling out the form below) and we’ll get back to you with a free international shipping quote within 24 hours!